Wow! Thank you all for your very kind comments on "My Lady's Quaker!" They really made my day! :) I decided to get out "With My Needle" yesterday. I finally finished up the bottom portion. All those swirlies were driving me nuts! I'm glad most of them are behind me now! 40 ct. Light Examplar, DMC threads (1 over 2). I also worked on my CHS Alphabet the other day, but forgot to post a pic. I have "Goose" finished and a start on "Horse." 36 ct. Examplar, Sampler Threads (1 over 2). Well, my oldest ds is home sick with the flu. Dh and I were going to go to Charleston. We were going to walk down King Street and go out to lunch. I was finally going to try shrimp and grits! But it looks like I'll be staying home playing nurse instead. Oh well - that's life when you're a mom! :) Write soon! Your WIPs are both so pretty! I love With my Needle! What a bummer that your oldest is sick with the flu! Seems like everyone is getting sick. Bleagh! Your WIPs look great. Vonna and I are getting ready to do a SAL of WMN. I am sorry your son is sick. You will love shrimp and grits when you get to try them. Yum! With my Needle is beautiful and something I've been planning to do, but now that you mention the swirlies....yikes. They look great, but I'll bet they're tedious. Bummer about the flu--it's going around the office here too. I'm hoping for speedy recovery for your DS and that you don't get it--occupational hazard! Lookin' good! Have you noticed that those pieces both have gold/orange tones in significant quantities? Looks so good and Autumnal! Beautiful WIPs! 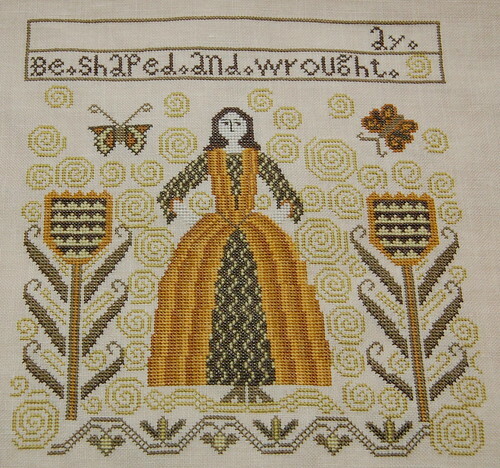 I loved stitching the WMN piece but boy, those swirls did get tedious! Sorry your DS is sick and you have to miss Charleston today - it is one of my very favorite places! Both WIPs are beautiful. My CHS A&E has those swirlies in it - how funny! So sorry to hear that the flu has struck your house - stay well!! I am so sorry your son is sick - that flu is just so horrible! I keep popping Airborne and praying I don't catch it! You have been a busy gal - those swirls would have driven me crazy as well - but she looks beautiful! And your CHS Alphabet is such a fun piece! Wow...that is so neat...I love both of your WIP's. They are going to be so beautiful when you get them both finished. Good Morning Nicole! Sorry your daughter is sick and your day with hubby is cancelled. Hope she gets well soon. Beautiful WIP's! Love the colors in the first one! ilove this "With my needles" it's really so cute ! and all the CHS alphabet is one of my project ..... but when i found time for it ! Hope your DS is better soon!! Your WIP's are both looking amazing!! Both of your WIPs are looking great. Oooh, fabulous! When will I ever get around to With My Needle? Both are looking gorgeous ! Hope your DS feels better soon. Well, you're making great progress, Nicole! I love your Quaker Lady finish and Elvis and Priscilla... er... Adam & Eve are spectacularly stunning too! Both With My Needle and CHS Alphabet look great! Our tastes in stitching are so similar. Hope your oldest son is feeling better. Is it H1N1? That has swept through here (Kentucky) in a big way. Bummer, so sorry you missed your day out with your DH. Hope your DS is feeling much better. Love your projects, they are both so pretty. Sorry your plans got canceled Nicole. Wishing your son a speedy recovery. I hope your other boys don't catch the flu. Your WIPs look lovely. Congrats on your finish of Quaker Lady. She looks lovely. Nicole, I have to tell you that I read your every post. I have you in my Google Reader so I see all the new posts whenever you update. I rarely comment, I know, a bad habit... So I am stopping by to say OMG! ALL your work is gorgeous! WMN is looking fantastic. Those swirlys are a pain, but look how beautiful it is! Kudos to you for stitching the Alphabet, quite an undertaking! MLQ is just beautiful, so soft looking and serene, Love It! Hope your little man gets better soon. Love your GH pattern, its on the top of my list to stitch. Your needles are on the move, the CHS looks great too. Hope you can reschedule your day with husband soon. Those swirlies were probably driving you to insanity, I'm sure. LOL Well, no matter, it's looking lovely. I love the progress on your alphabet. it is lovely ! I like all your needlework very much indeed ! congratulations for your nice blog !